As I’ve recently written, I am the coach of a very successful and very large middle school speech & debate team. It’s a huge job to coach all of these kids, but it’s amazingly rewarding. It’s rewarding to know that the kids who were always talkers have some kind of outlet for competition. However, it’s just as rewarding when a student who once couldn’t raise his hand in class can now stand up and get through a history speech without excusing himself halfway through his oral report. The fact is that when students apply to join the elective, I split the enrollment numbers between those who show aptitude in oral presentation and those who desperately just need the skills to speak up as their own advocate. The win to some coaches may be about the numbers of trophies, but as fun as it is to win, the real win is in seeing the growth in all students. I keep files on all of my students noting their base level of oral speaking, and our goal as a team is to bring up everyone’s level of presentation. That is, in order to do well in the class, each student must show growth based on his or her own start level. A kid who constantly win trophies might still get a C in the class. A student who will never break into finals might still get an A. A trophy is gravy when the goal is simply to learn. I have coaches come and observe me occasionally, and they want to know how my team, a diverse group of students from a Title I district, can achieve as well as we do. How is it that without spending funds on supplemental outside coaches, our students are still so strong? How is it that without additional support, an archive of nationally winning speeches, or without an adult’s hand in our originally written speeches, how is it that our students can still write and produce at so high a level? So I figured today I’ll tell you my secret sauce: We build community. That all. That’s it. You want your team or your classroom, for that matter, to succeed and achieve? Spend time on making those students a tight-knit community of learners. It sounds hokey, but it’s vital. If you want to win, whether it’s at test scores or trophies, you can’t develop a group that doesn’t care about the growth of its individual members. If you want students to improve, you have to have students willing to model for students and students willing to learn from students. You have to develop a group that can compete against each other as a means to learn and still sit with each other at lunch. Sure, you can have informal competitions within the community, but not until it becomes a community. The goal is to desegregate the class immediately, break down cliques and self-imposed groupings so that the clique is the community itself. We applaud loudly for those on the team who win 1st place, sure. But you should hear the multipurpose room when a kid who has never trophied before eeks onto the trophy stage at 6th place. The activities I do with my speech and debate class are those that I also do with my Language Arts class. I tweak them, of course, but the fact is that if you want to create a group of students who can lean on each other, help each other, give and receive feedback from each other, and don’t accept anything less than any of its member’s individual best, then you’ll spend some time in the beginning of the year, and ongoing throughout the year, building community. 1. 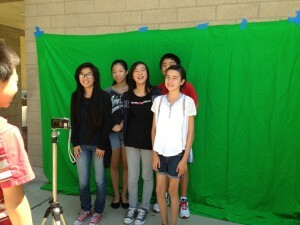 Lip-sync music videos – Right at the onset, I break the students into groups in which they have no say. I make sure I mix them as much as possible: different ability levels, different grade levels, different races, different levels of friendships, different elementary schools (regions of the city), etc…I break up any group that came into the door together. Students are then given the task to find a 2-min song and record a lip-sync to that song – the goofier the better. It’s about leaving all dignity at the door, working together, and getting to know others. Then, we have a film festival. They are scored on their attempts at precise lip-synch, facial expression, precise synchronized blocking, and visually working as a group. The come away for content area teachers might be the positive use of heterogeneous grouping. Most of the time, student choice is the way to do. Many times, grouping by level allows for targeted guidance. But when it comes to building community, shake ‘em up like Chex Party Mix. In other words, at it relates to the speech class, without choosing to work with a foil, an opposite, one cannot learn or perform to the degree one could when working with someone similar in skill. When students ask to work with each other, I ask them to reflect first on what their strengths and weaknesses are as presenters. Does your partner fill in a gap that exists in you? Does your buddy bring something to the table that you do not? If both kids are weak in facial expression, will they learn by working together? Potential partners must at least make the case for how their collaboration will see them grown in their weaknesses. 3. Different Group Structures for Different Activities – Every activity, I mix up the kids differently, and they never know what it’s going to be when they walk in for class. Will I be grouping them by categories? Will I be grouping them randomly? Will I be grouping them alphabetically? Will I be grouping on their level of ability? Will I be grouping based on their status as veterans or newbies? I have activities in which students watch each other perform, give each other feedback, fill in mock ballots as a means to advise, and even dual each other simultaneously to distract their opponent. But these activities would never work if students worked with the same teammate every time. They need new eyes to see their speeches, new voices from which to hear feedback, and new personalities from which to learn. The common element in each of these strategies or activities is, of course, collaboration. It’s cyclical, you see. Collaboration leads to Community and a deeper community leads to more successful collaboration. It’s strange when we encounter teams whose desire to compete overrides their ability to appreciate competition. Sometimes we compete against whole teams that are instructed not to talk to other competitors. Sometimes we find coaches who believe elitism is the only way to win. I am proud to say that our team proves these attitudes to be silly. There’s no mystery to our team’s success. It’s in learning to respect those WITH whom you are competing. And, as it turns out, there also develops a respect for those AGAINST whom we are competing. For they too are an extended part of our team’s family…even if they won’t talk to us. Cultivate that way of thinking and you will have developed a community of those who love learning together. Be it for a Math Olympiad, a Chess club, a Language Arts class, or a Speech and Debate team, working together to learn the love of learning is what school should be about.